Review: For you die hard Harry Potter fans out there, know that this review is going to be as spoiler-free as possible. You’ve waited far too long to have the secrets of Fantastic Beasts and Where to Find Them spoiled for you so…read on with confidence. It’s been five years since the world said good-bye to Harry Potter and company after the films based on the novels by J.K. Rowling concluded. We all knew the end was coming and it was still hard to bid adieu to these characters and the actors we watched grow up over the course of nearly ten years and eight films. Still, we never really said farewell because Rowling has made sure Potter lives on in theme park attractions (been twice to the one in Orlando and it’s, of course, excellent), on the Pottermore website, and even in a stage adaptation taking London (and soon Broadway) by storm. The hunger for more adventures in wizardry was clearly there but how do you get back to business without sullying the memory of a beloved franchise? The answer: start a new one. 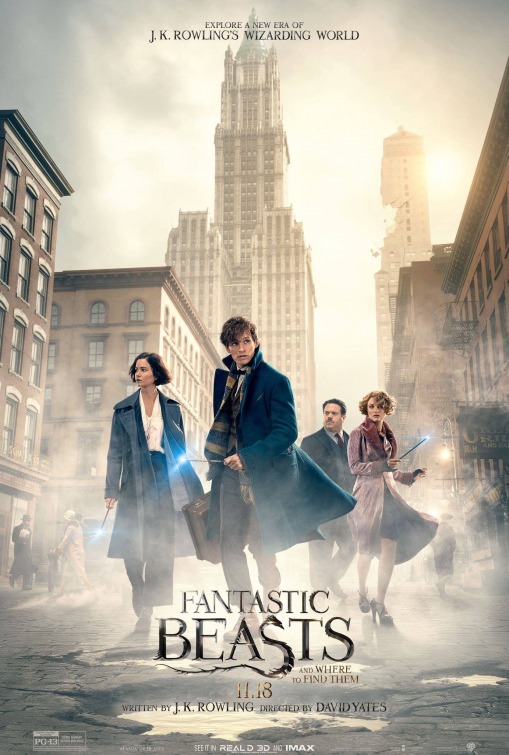 Adapted by Rowling from her 2001 field guide published as a fundraiser for charity, Fantastic Beasts and Where to Find Them is your way back into Rowling’s creative creation and fans of the series are sure to find this was worth the wait. Or is it? If I’m being honest, I had a hard time finding my way in this new world and it’s not because it doesn’t do its job or because it doesn’t fit into the same universe as the series it was spun-off from. My main problem was that with the Harry Potter movies, we knew what to expect and came looking for our favorite parts of the books to come to life onscreen. There was an endgame to work toward that had set boundaries and pre-defined beats to hit. We don’t have that same advantage in Rowling’s original screenplay which spells a fun discovery for some but uncertainty for others, including this critic. Arriving in New York City in the late 1920’s, Newt Scamander (Eddie Redmayne, The Theory of Everything, sketching Newt as decidedly on the spectrum) hasn’t come alone. Toting a suitcase with enough capacity to make Mary Poppins green with envy, he’s arrived from London with a mission to restore a “fantastic beast” to its rightful homeland. Before he can get very far, however, he finds himself chasing down some escaped creatures with the help of an American auror (Katherine Waterston, Inherent Vice) working for the Magical Congress of the United States of America (MACUSA), her mind-reading sister (Alison Sudol, What to Expect When You’re Expecting), and a No-Maj (Dan Fogler, Europa Report) that mistakenly switches suitcases with Scamander to disastrous results. As if that weren’t enough, Rowling get political (and dark) with the inclusion of a family of Second-Salemers who seek to rid the country of the witches and wizards they suspect are living amongst them. The matriarch (Samantha Morton, John Carter) is another grave, frightening character crafted by Rowling to represent much of the racism, bigotry, and even homophobia of the day. Her adopted son (Ezra Miller, Suicide Squad) has clandestine conspiratorial meetings with a MACUSA big-wig (Colin Farrell, Dead Man Down) that are staged uncomfortably on purpose by director David Yates (The Legend of Tarzan) and are open for multiple interpretations. Yates guided the last four Potter films and is signed up for the next installment of Fantastic Beasts. It was a wise decision to keep him involved as he brings a needed tonal consistency to this new jumping off point and nicely balances Rowling’s twists and turns with more than a few delightful moments of special effects flights of fancy. Yet the movie is too long by a good ten minutes, oddly choosing to linger when it should leap. These are all the problems that go along with the first film in a planned franchise…by the time you arrive at a nifty final twist (and it really is a good one) you realize all of it has been in service to setting up the next four films. As has been the case recently, Fantastic Beasts and Where to Find Them is another example of a film marketed to all ages of the family audience that’s far too scary and dark for young children. The Potter films always had sadness at their core but this feels exceedingly bleak and unrepentantly so. Parents are encouraged to view this first before letting kids under the age of 10 have a look. For us grown-ups though, whatever faults lie in the story or calculated forward-looking set-up are lessened by Rowling’s admirable devotion to character development that seems to only richen the deeper you look and the super-duper production design and special effects that put you right back into Depression-era New York City (I half expected to see Annie cross by at ay moment). More good than fantastic, this first entry in the next saga of Rowling’s witches and wizards is far from a disappointment but could have been tightened and brightened in order to live up to it’s title.